Hello! I’m Chelsey from Budget Girl and I’m so excited to be guest posting for Deby! First, a little backstory. I started blogging in October 2012. In September 2013, I began self-hosting. My desire was, and is, to monetize…which means my efforts in getting my blog seen have quadrupled. I feel that’s important to note because, without full-time-job-level effort, getting a blog off the ground and into Monetization Mode can be very difficult. One question I have been receiving a lot since self-hosting is this: “How have you gotten so many followers on *insert social media platform here*?” It’s an interesting question that I’ve been thinking about a lot lately. If I were to pick the single most important thing I did for my blog, it would be utilizing as many social media platforms as possible. 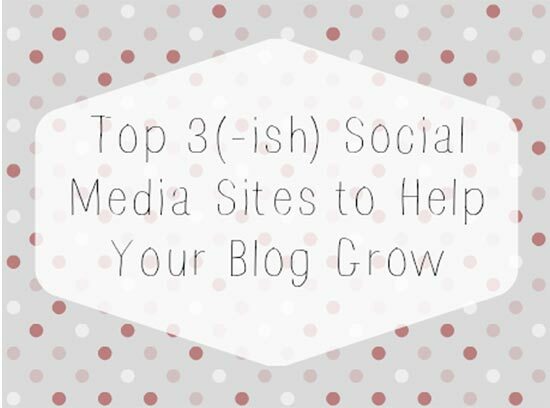 I definitely have a top three—which I’ll be sharing with you all, and I’m pretty sure my list will surprise you!—but there are so many that are useful in ways that, one year ago, I couldn’t have imagined. I should probably begin by saying that I will not be including Search Engines, even though they are by far my most lucrative source of traffic. The reason I won’t be talking about that is because it involves a whole messy needs-to-be-its-own-post deal with SEO. Plus, Deby already wrote a post on that topic, so let’s move on. Anyone who blogs about food isn’t surprised that Pinterest is not only my number one source of traffic, but that it is literally thousands of hits higher than my number two. In fact, there is a 9,000 point drop from Pinterest to my second highest platform. How did that happen? : Believe it or not, my numbers weren’t that high this time last year. It wasn’t until late last spring that I completely revamped how I handled Pinterest. It began with pictures. I learned how to take better ones and then I used a free program called PicMonkey to add overlays and text. The reason this is important is because, besides the fact that no one wants to pin an ugly picture, people are also kind of lazy. I don’t mean that in a mean way, I mean it as an undeniable truth. I’m just as lazy. In fact, my own laziness is what inspired me to make these changes! The first thing I judge a pin on is what the picture looks like. And since I do most of my pinning from a mobile device, I prefer to be able to tell what a pin is about without having to scroll to the bottom and read the description. The second change I made is that I started tagging. Tagging is invaluable and I used to hate it. I still kind of do, actually. I hate those ugly little hashtags taking up space and I hate how obnoxious it comes off to anyone who doesn’t blog. But it’s important, even if non-bloggers don’t understand why. It allows you to use keywords—not included in your title—to help people find your posts. They type keywords into a search box and boom! You pop up. It’s magical. This isn’t just a Pinterest thing, either. You can use it on basically any kind of social media platform, like…. While we were discussing a topic for my guest post, Deby and I agreed that three would be a perfect number because, as she phrased it, “Who has time for more than three?” Agreed! I went in fairly confident that StumbleUpon would be in and Facebook would be out…but to double-check, I looked at the numbers. It turns out, Facebook and StumbleUpon have been leap-frogging one another for the last few of months. This surprised me, most of all because there is such a huge difference in how long I’ve had each one. StumbleUpon was one of the very first social media sites that I utilized. I discovered it while I was in college, sitting through an incredibly boring lecture. StumbleUpon became a great way to silently entertain myself in classes taught by professors who insisted on reading to us directly from the textbook (ugh). So when I created my blog, I knew immediately that it was something I needed to incorporate to get my numbers flowing. For once, my intuition was right. StumbeUpon gets me hundreds of hits each day. How did that happen? : My guess is that it’s because using it is so simple. Most browsers allow you to have add-ons or extensions. Just search for something like, “Google Chrome StumbleUpon” and install the add on. Create an account and you’ll be able to give different websites a “thumbs up” or “thumbs down.” (I think in Firefox, it’s either, “I like it” or “I don’t like it.” Either way.) Most likely your content is going to be safe-for-work, so just pick a category and type in some tags for your post. And, yes, you have to do this for every single post. Fortunately, it doesn’t take very long! Once you have it set up, Stumble users just have to click their Stumble buttons and get taken to some random page on the Internet. That’s all it takes to use the program. You click “Stumble” until you find something you like. Every time you “like” something, StumbleUpon uses it to hone in on your interests and then shows you more things it thinks you’ll like. It’s incredibly easy and can provide hours of entertainment. Facebook, on the other hand, was utilized in September 2013, when I began self-hosting. Which is why it is such a huge surprise to me that its All Time numbers are the same as StumbleUpon’s. How strange! How did that happen? : With Facebook, I basically do the same thing as with Pinterest. Upload a photo, type in the name, tags, and then end with the link back to the post. I use the WordPress.org client, so it actually posts to Facebook on my behalf…but it doesn’t add tags or anything. I let it post, anyway, just in case I can’t get to it. But when I can, I delete the original post and create another with the tags included (I really wish Facebook would just let me edit them). This is, again, another site that I utilized immediately after creating my blog. I’ve been using Tumblr for years just as something to do when I’m bored. It’s a great source of entertainment. The great thing about Tumblr is how easy it is. I don’t do a single thing! Again, I use the WordPress.org client, so I can’t speak for any other blogging site. But I have my account set up to post on my behalf and it even add the tags for me! It’s awesome. Still, many people haven’t heard of it and even those who have don’t use it to their advantage. Whenever I tell someone about Tumblr being one of my top traffic sources, I always receive a surprised, “Really! ?” Yes, really! My only problem with Tumblr is the image-stealing bloggers. This isn’t just a problem with my blog, it’s a problem with basically all blogs. It’s not unusual for someone to “reblog” something I posted and then change the link from my page to their own. Putting a watermark on your image can end that—I had a ridiculously large one on my images for a long time, but I was unhappy with how it looked so I got rid of it. Even with other bloggers stealing my credit, Tumblr made it into my top 3-ish list. So it’s definitely worth the effort! I know many of you are probably wondering why Twitter and Bloglovin didn’t make the cut. First, Bloglovin would have if I had gone to five. Twitter, on the other hand, doesn’t even make my top ten. I’ve found Twitter to be sort of useless (though not enough to stop using it) and I think I understand why…to an extent. Twitter does work for a lot of people. If it didn’t, it wouldn’t be so popular. The problem is that you have to constantly be tweeting in order to be heard. I have neither the patience nor the time (…nor anything new to say that would fit into the 140 character limit). I’ve witnessed Tweeters sit there for hours and tweet back and forth with each other. If you’re not willing to do the same and essentially spam your followers with constant tweets, you’re going to get buried and your tweets will go unseen. It does get me some traffic, though, so I certainly advocate using it. Obviously what does and doesn’t work for me may be different for others. It will depend greatly on your audience and on the topics you prefer to write about. So my best tips are to use what work, what you have time for, and automate whenever possible! Very interesting! I have not anything with StumbleUpon or Tumblr. I’ll have to check them out. I’ve just started using Stumbleupon Jann. Traffic is starting to trickle my way as a result, and the more content I have there, then the more traffic I should get. Certainly an easy option to use. Personally, I find Twitter pretty useless too, but I think I’m too old to understand it or see the need or attraction! I grew up long before the texting generation. I’d love to get a post from you about Twitter. Would you like to write about your own experiences? I’d be happy to have you write a guest post for the site Miriam. Just drop me an email at [email protected] and we can chat. As I said, it will be different for everyone. I’ve noticed that Twitter success also seems to depend heavily on the type of blog. Frankly, I got so sick of scrolling through 20 pages of the same person incessantly Tweeting for hours that I’ve stopped actively using it. I found you don;t have to read tweets on twitter to use it effectively. Only takes a few minutes a day. I’ve submitted my blog post to Deby so either she will post it or I will post it on my own site. Miriam’s great post on how to use Twitter to drive traffic from big brands to your blog posts will be on the site soon. I had no idea! I have yet to get on Tumblr but Pinterest, Stumbleupon and Facebook are my top three. I get the most engagement (pluses, reshares and comments) Google + but don’t see much traffic to my blog. This looks like a very helpful article, I’m gonna pin it just now to read when I have time to take it all in. Thanks for this. With Stumbleupon and tumblr do you have to grow an audience as with Facebook and pinterest? I’ve just learned about StumbleUpon, and I’ve loved it, but haven’t used it to drive traffic to my blog. So glad to hear it’s been successful for you. I need to get going on it! Thanks so much for your advice. Always great when others are so willing to share. Have a great day! I love Google+. I think the key to getting your links clicked through is to actually engage – not only plus, but leave thoughtful comments and share posts that are meaningful to you. I joined Google+ a few months ago, but in the past few weeks I’ve actually engaged, and it’s definitely showing up as visitors and followers on my blog. My top 3 are Pinterest, Facebook and Twitter. I have just started using StumbleUpon so hopefully in months to come that with grow. How are you using Tumblr? Are you just loading a photo and a link back to your main blog? I’d love to know more about that. Great tips Chelsea! I think the one I’m really going to “take home” is putting tags on my pins. I also hate it when there’s tags on pins and everything else, but it seems like it’s pretty necessary these days. Thanks so much for the tips! Pinterest and StumbleUpon are my favorites along with some private networks that I belong to. Twitter works a bit for me because of the private networks. So helpful, I would of never of thought to use Tumblr but I can see why it’s useful. Twitter is like you said useless, and bloglovin I really havent gotten into. Stumbleupon is new to me, i’ve never heard of it. I wonder though where Instagram is on your list. Hi Jamie. I don’t even have a Instagram account, and don’t think its right for my niche anyway which isn’t very visual. But its funny what you say about Twitter, because one of the other commenters strongly disagrees and has written an interesting article which will publish on the site next week. She gets great traffic from Twitter and will tell us her secret! Watch out for it. you are probably right… maybe.. I think instagram is important for raising brand awareness, but doesn’t necessarily drive traffic. All good insights. It’s great to hear what is working for other people! That’s interesting to read, in fact for my blog too i have been using pinterest and that is one of the major traffic sources. However with stumble upon, there is a bit of problem i always face. The day i post any of my articles there i get traffic but from next day onwards i never get any traffic. Also i am unable to get any followers, though i have tried hard. Tumblr has been so far okay with me, sometimes i get traffic sometimes i dont. I find the same with Stumbleupon – the traffic only lasts one day and then its gone. I do have my sites on Tumbler, just started as a result of this article from Chelsey, but have yet to see any visits as a result. I think as with all things, you get out of them what you put in, and I’m not finding the time to put in a lot of work on social media. Agreed! i have had success with tumblr though not in a very big way. i have been using tags there which have helped me but basically i have seen be it any network what matters the most is that you need to be socially active, you need to repin other’s pin, the same way you have to repost others’s post on tumblr. Repinning other’s stuff and following other blogs is definitely helpful. I think Tumblr is also more useful depending on your niche. Fashion and food seem to do the best. Though that doesn’t necessarily mean others can have success. Hopefully you have some luck with it! It’s interesting that Google+ is your number one! I started really utilizing it after this post went up and I’ve gotten some traffic from it (once I figured out how to make it stop publishing as private 😛 ), but it’s still not one of my top ones. Only time will tell, though! I am on Stumble Upon but have not used it much lately. I mainly focus on facebook and pinterest. I recently joined twitter but don’t use it that much – trying to use it more but only so much time in a day. After reading this maybe I won’t worry about twitter so much. I signed up for StumbleUpon about a month ago and I feel really perplexed as to how to use it and get full benefits from it. I think I need a full blown tutorial. I keep on hearing Google+ will be the next big thing… but then I’ve been hearing that for a while now. I’ve learned more about StumbleUpon since writing this post and, you’re right, it requires its own tutorial. The biggest thing I’ve discovered is that if you’re *only* stumbling your own stuff, SU will mark your account as spam and make it more difficult for people to stumble onto you. So you have to add other people’s stuff to it, as well (in fact, it has to be the majority of what you stumble). I hope that helps! I was curious when I looked at my traffic sources from GA most are from sites I think are search engines that I submitted to from site pro news which has links to all the tools from webmasters to SEO and much more with amazing too topics that will let you submit your site for free to I think 20+ search engine and google, bing, and Yahoo was included I believe but my pinterest is very popular for repins over 1000+ a week but I can’t seem to get it to grow more now as followers and traffic is ok. So how can I get more noticed on social media even though I do the group’s and try to post regularly I’m just not noticed as much as I was before I started a blog. My direct traffic is 72% on GA stats. I can’t understand the difference in before and now. StumbleUpon and Tumblr is new to me, I dont know ow to use and get traffic from those, anyway let me try and will notify to all of you with my updates how I’m doing with them.